The body established by Tony Abbott to advise the prime minister on Indigenous issues has temporarily ceased to exist, but Malcolm Turnbull’s office said it was still committed to keeping it. The ABC understands Cabinet will approve the appointment of a new head and some new members next week when it meets. 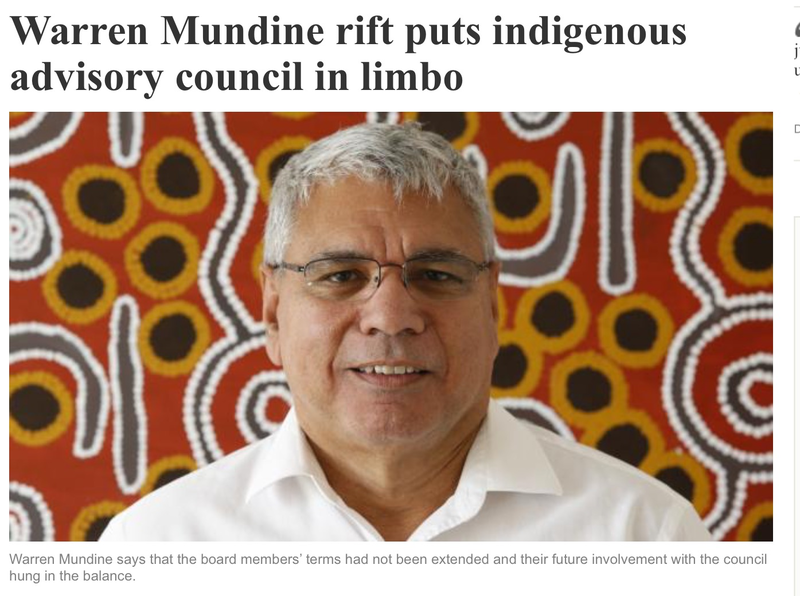 Head of the Indigenous Advisory Council (IAC) Warren Mundine has been informed his role and the body itself — established after the 2013 election — have been dissolved. Mr Mundine is understood to have received an email from the department of Prime Minister and Cabinet to inform him that all further meetings and activities were now cancelled. Mr Mundine has not been officially informed by Mr Turnbull himself. But last night a spokeswoman for Mr Turnbull said the Government was still committed to continuing the IAC. “Appointments are currently going through the usual cabinet processes,” she said. Mr Turnbull extended Mr Mundine’s role as chairman of the IAC by only one month, in December, with the future of the body and the form it will take up in the air. A spokesman for Mr Turnbull in December said: “The Government has committed to continuing the Indigenous Advisory Council and all existing council members’ terms have been extended until January, 2017. Mr Mundine’s extended contract, originally given to him by Mr Abbott, has now expired. The Aboriginal leader has had a rocky relationship with Mr Turnbull, previously slamming the setting up of an Aboriginal incarceration inquiry. Mr Mundine questioned which “dickhead” had thought up the Australian Law Reform Commission’s inquiry into possible remedies to the incarceration crisis, announced on Thursday. A rift between Malcolm Turnbull and Warren Mundine has led to a shake-up of the Prime Minister’s peak indigenous ­advisory body, which is now in limbo. The high-profile Aboriginal leader, who in December said Mr Turnbull had temporarily stopped speaking to him, said he had been ­told his role, and that of the nine other members of the Indigenous ­Advisory Council, had been dissolved after their terms expired. Two other members of the board, whose positions are now unclear, last night also criticised Mr Turnbull for being out of touch with indigenous affairs. Council member Josephine Cashman blasted the Turnbull government for “not having its finger on the pulse” of indigenous affairs policy, saying that while she had been expecting the body to be wound up, she had been told nothing. “As far as I know it was only extended until the end of January but I’ve heard nothing … I can only assume it’s finished,” said Ms Cashman, a Worimi woman who chairs the council’s safe communities committee dealing with the critical issue of indigenous domestic violence. Cape York leader Richie Ah Mat, a member of the advisory council since its inception under former prime minister Tony ­Abbott in 2013, told The Australian: “I don’t think the chief, the PM, was getting the message”. Mr Ah Mat said there had been silence from the Prime Minister’s office since the council delivered him its final report for 2016 in December. Mr Mundine told Sky News last night that the board members’ terms had not been extended and their future involvement with the council hung in the balance. “As our term was put until the 31st of January, that’s now gone and so we’re out of a job,” he said. The news comes on the eve of tomorrow’s release of an Australian National Audit Office review of the government’s Indigenous Advancement Strategy funding policy, which is expected to be critical of how Mr Abbott’s signature policy of Aboriginal and Torres Strait Islander affairs was implemented. It is also only days from the delivery of the Prime Minister’s annual Closing the Gap report into indigenous disadvantage. A spokeswoman from Mr Turnbull’s office said the Prime Minister was “committed to the continuation of the Indigenous Advisory Council”.